The smiling maneki-neko always welcomes visitors to Hirome Ichiba in Obiyamachi, Kochi city. “Irassyaimase! Ikagadeshoka?” (Welcome! Would you like to try this?) From inside the hall, high-spirited voices spill out the gate along with delicious smells. Inside, the burning fire to cook one of Kochi’s famous foods, Katsuo-no-tataki, surprises and attracts all visitors, especially foreign tourists from China. Hirome Ichiba is a food court of 63 food stalls and shops that sell many things, not only the famous foods in Kochi, but also French, Indian, Chinese and Korean, unique sundries and clothes. Construction of this market was a core project for increasing visitors to promote creating lively Kochi. Hirome Ichiba opened on 17th October 1998 and is now in its 19th year. For many years, a wasted empty lot sat in the center of downtown Kochi. Then someone had a bright idea. After long cooperation with the local construction companies, construction began. Their act led to a massive success as never before. Every year, approximately 2.8 million people visit. Customers are not only locals, but also from other prefectures and countries– all around Asia, English-speaking countries, and even Africa sometimes. The reason that such a large number amount of people are drawn is due to the location. Around Hirome Ichiba, there are the most local famous places such as Kochi castle and the Harimaya bridge. 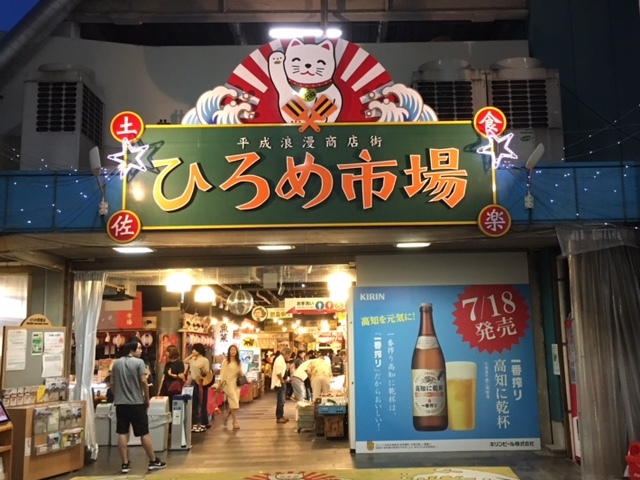 Events are held nearby such as Sunday market and Yosakoi festival, too. Also, there are a lot of hotels in the area so it is easy for travelers to visit any time. Looking around inside Hirome Ichiba, people find many large tables that seat 6 to 8 people per table. People can bring what they brought, eat anywhere they can find in Hirome Ichiba. This system was introduced in 1998 with the purpose to have visitors to enjoy Kochi’s culture. “If there are huge table many people can sit together, they can have a lot of opportunities to have conversation with strangers,” people who engaged in constructing Hirome Ichiba thought. Although such markets were constructed in other prefectures imitating Hirome Ichiba, they haven’t been as successful. Hirome’s success might be due to Kochi’s great culture, history and especially atmosphere. The focus now, however, is on future generations. I really love this place. Good foods, good drinks, and especially good people! Hirome-ichiba is one of the reasons why I love Kochi. Nice story!! It was interesting for me that the artificial system since 1998 becomes Kochi’s culture. Drinking is a great culture, especially in Kochi. It’s a way to connect people who would never meet in your lifetime if you are not there. I just want to experience the Kochi culture by reading your essay. It should give me a lot of information about Kochi, and it makes it possible to compare with my home prefecture. I love Hirome Ichiba!! Everybody can go and enjoy eating and drinking. This is one of best place worth visiting in Kochi. It was interesting to learn how Hitome Ichiba was born! I want to go here again and enjoy Kochi’s culture! Wow, there are 63 food stalls and shops in Hirome!! Good story!